It’s not often that I’m frightened by a press release headline, but I must admit I was severely taken aback when I spotted this one last week: “SAF Issues Travel Advisory to Gun Owners: ‘Avoid California!’” Yikes! I live in California! What’s going on here? I’m not a gun owner, though. Does that mean I’m safe? Are gun owners being locked up or executed? Apparently, those of us who live in California are in mortal danger due to lack of weaponry. I have to admit I was a bit perplexed after reading the entire press release. I’ve lived in California for a very long time, I’ve never owned a gun, and I’ve never been shot at. I haven’t even had to change my route to avoid a gun battle. Have I just been lucky? I’d always thought that having fewer guns around was safer than having lots of guns for everyone. But I guess it depends on the situation. After all, if you have a strong point of view, any situation can support your position on guns. I hadn’t realized that Democrats were the cause of gun violence. Perhaps we need Democrat control. The press release goes on to say the incident could have been a lot worse if police hadn’t been on the scene with guns. “But what if they hadn’t been present? OK. But what if the original shooter, driven crazy by Democratic hate speech, hadn’t been able to get a gun in the first place? That question didn’t get asked. Hypotheticals are wonderful and malleable things. To be honest, I wasn’t terrified by this statement. Maybe I should have been, but it seemed so hilarious. This was a joke, right? I don’t know why they didn’t stop there. I also don’t know why this warning was necessary. 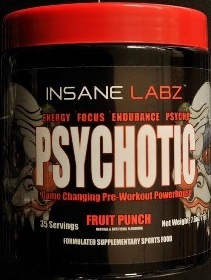 Why would anyone ingest something called Psychotic made by a company called Insane Labz? You’d have to be psychotic, and then it wouldn’t matter. I’m guessing a lot of studies. I’m also guessing there will a good number of closed congressional committee sessions. I don’t want to think too much about those.